Origin of Celestion Speaker Manufacture: China. Vox introduced the AC15HW Series amps in 2010. There were two models. The AC15HW1 was a point to point hand wired amp that featured one Celestion Greenback 12" speaker. The AC15HW1X was identical to the AC15HW1 except that it featured a Celestion Blue Alnico 12" speaker. 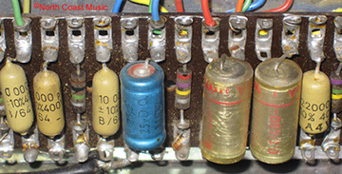 The Vox AC-15 tube amplifiers produced by JMI (Jennings Musical Instruments) from 1958 through 1969 were hand wired and featured point to point construction. While the term "hand wiring" indicates the chassis components were manually inserted, wired and soldered, point to point construction adds yet another dimension. Point to point construction requires that every electrical junction in the amplifier be completed by direct interconnection of the component leads or wires without the use of circuit boards. Point to point amps are usually constructed on lug strips or turret lugs. 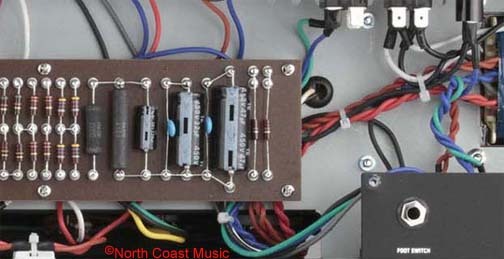 The photo below shows these lug strips and the hand wired, point to point construction of a 1960 JMI Vox AC-15. 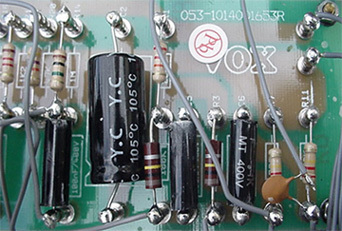 Vox AC-15 amps manufactured by JMI in the 1960s set the standard for what a reissue hand wired AC-15 should be. 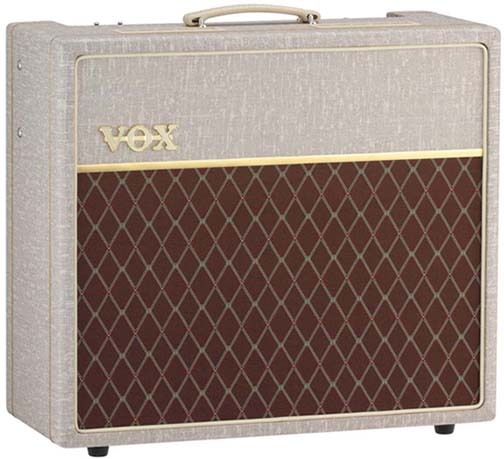 After the collapse of Vox into bankruptcy in 1969, the AC-15 dissappeared from the Vox product line for over twenty five years. After Korg purchased Vox from Rose Morris in early nineties, the reissue AC15TB was introduced in 1995. Several other iterations surfaced between 1995 and 2010, including the AC15CC1 (2005) and AC15C1 (2010). These models were all designed on a printed circuit board. None of these models qualify to be designated as a hand wired amplifier. However, Vox introduced the hand wired AC15H1TV and AC15H1TVL amps in 2007 to commemorate the fiftieth anniversary of Vox. These amps were produced for Vox in China under subcontract by the International Audio Group. Like the early JMI AC-15/4, the AC15H1TV featured the EF86 preamp tube. It also featured a EZ81 tube rectifier. However, while hand wired, the AC15H1TV did not feature point to point construction. The electrical components were hand wired to turrents mounted to a circuit board with underlying copper circuit traces (see photo below). Like JMI AC-15 Vox amps from the 1960s, the 2010 model year Vox AC15HW1 and AC15HW1X amps feature true point to point, hand wired construction. In addition to a EZ81 rectifier, the tube complement includes three ECC83 (12AX7) preamp and a matched pair of EL-84 output tubes. The amp includes a Normal and Top Boost channel, each with dual inputs. 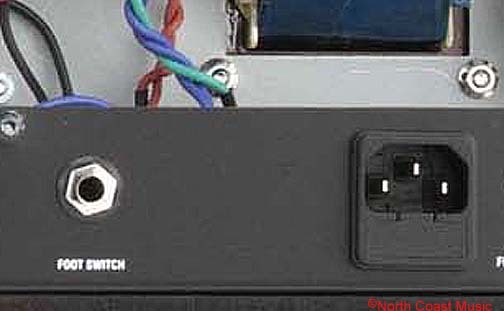 The Normal channel has a Bright switch; the Top Boost channel has treble and bass controls in addition to a "Hot/Cool" gain switch. The gain control may also be actuated from a single button foot switch that is included with the amplifier. 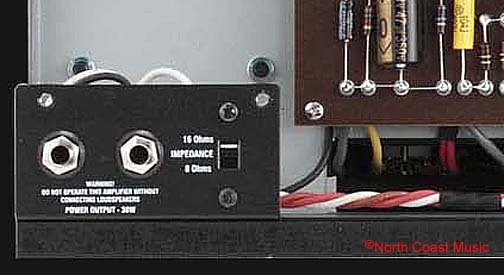 An O/P mode switch drops the output power of the amp from 15 to 7.5 watts. The 2010 hand wired AC-15 amps were produced in Vietnam and the Celestion speakers used in these amps were produced in China.